Thomas Concrete to install CarbonCure's technology at 16 additional plants across Georgia and the Carolinas making it the world's largest supplier of concrete made with award-winning CO2 recycling technology. Atlanta GA – Thomas Concrete Inc., the largest independent ready mixed producer in Georgia, North Carolina, and South Carolina has announced that they will install CarbonCure’s retrofit technology into an additional 16 ready mix concrete plants in early 2018. Thomas Concrete has previously installed CarbonCure’s technology in six locations in the Greater Atlanta Area. Now with a total of 22 plants licensing CarbonCure’s technology, Thomas Concrete is CarbonCure’s leading partner producing concrete made with carbon dioxide (CO2). By partnering with CarbonCure, Thomas Concrete recycles waste CO2 into concrete to increase its environmental, material, and economic performance. Not only is the CO2 permanently converted into a solid mineral within the concrete, but the addition of CO2 also improves the compressive strength of concrete. This has allowed Thomas Concrete to optimize their mix designs to unlock operational efficiency while reducing their carbon footprint. Thomas Concrete is a member of the Swedish, family-owned company Thomas Concrete Group AB, established in 1955, and operating in USA, Germany, Sweden, Poland and Norway. After acquiring ready mixed plants in Myrtle Beach earlier this year, Thomas Concrete now has 67 plants in the Southeastern United States and a total of 144 plants across the globe. Thomas Concrete and CarbonCure XPRIZE Team visit the 725 Ponce de Leon construction project in Atlanta, GA.
Thomas Concrete’s sustainability leadership is also facilitating global development, commercialization, and adoption of CO2 utilization (also known as CO2 conversion) technologies. Thomas Concrete has been one of CarbonCure’s key on-going partners in the NRG COSIA Carbon XPRIZE, a $20 Million global challenge to accelerate international adoption of technologies that convert carbon emissions into valuable products like concrete. A recent industry report identifies concrete as the greatest near-term opportunity for converting waste emissions into products, and that CarbonCure’s technology is the most promising and scalable technology in the space. 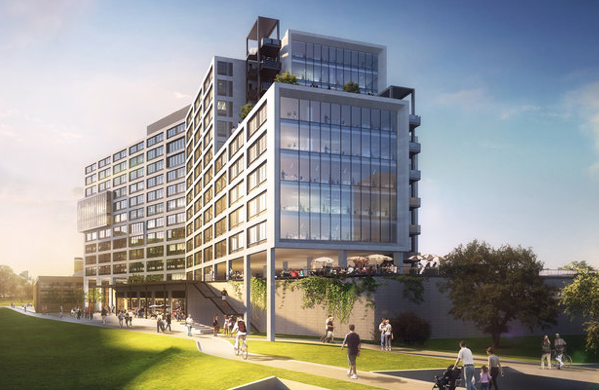 For the upcoming 725 Ponce in Atlanta Thomas Concrete will be supplying 48,000 cubic yards of concrete made with CarbonCure's CO2 recycling technology. After 30 years of serving customers, Thomas Concrete is one of the leading suppliers of high quality ready-mixed concrete in the Southeast United States. By combining delivery of concrete with our wide range of services, Thomas Concrete provides complete and effective solutions for construction projects. Thomas Concrete is a member of the Swedish, family-owned company Thomas Concrete Group AB, established in 1955, which operates in USA, Germany, Sweden, Poland and Norway. The company’s environmental policy lies at the heart of its identity. The Thomas Concrete mandate is to continuously strive to develop solutions for a sustainable society of tomorrow. Learn more at www.thomasconcrete.com.